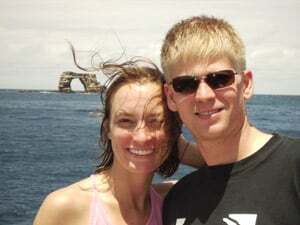 My wife, Brenna, and I are the adventurous types and we wanted our honeymoon to be to somewhere special, a trip that is as exciting as our relationship. We are avid scuba divers, and after some research we chose the Galapagos Islands (an archipelago in the Pacific Ocean, off the western coast of Ecuador) as our destination. The best way to dive the Galapagos is on a live aboard dive boat, which is a 100 foot plus luxury yacht, set up to serve as a hotel and a support vessel for scuba divers. There are only a handful of such yachts certified to take divers to the most remote reaches of the Galapagos Islands, and the boat we chose was the Deep Blue. The accommodations on board the Deep Blue were fairly functional, but Brenna and I were fortunate enough to get the only state room on the boat with a double bed (a definite perk for a honeymoon). The food was plentiful and delicious. My wife is lactose intolerant and the chef was willing and able to accommodate her. The best thing about spending a week on board the Deep Blue was the diving. We boarded the Deep Blue on August 4th, 2008 and over the week we dove fourteen times. Every time we slipped below the waves we were treated to more exotic sights. We swam with sea lions, dolphins, whale sharks, sea turtles, eels, manta rays, eagle rays, octopi, seahorses, and countless other aquatic animals. We went nose-to-nose with Galapagos Sharks and Black Tipped reef sharks. I stopped counting hammerhead sharks in a school that was surrounding us at 50 and I could have kept counting for a very long time. Whale sharks are the high point of any Galapagos Island dive trip. We saw four of these gentle monsters. On our first day of diving Darwin's Arch (an island with a natural arch at the farthest reaches of the archipelago), we saw a "baby" whale shark that was about 25 feet long. The largest of these gentle leviathans that we encountered was a 40 foot plus monster that we ran into about 75 feet below Darwin's Arch. Whale sharks are amazing because, although they are enormous, you often times don't see them until you are right on top of them (or they're right on top of you). They are so huge and displace so much water that you can feel the current that they create as they swim by you. The dive masters on board the Deep Blue were helpful, concerned with safety and entertaining. They made it a point to take us to the most out of the way dive spots to show us the most unusual and reclusive of the Galapagos's underwater residents. 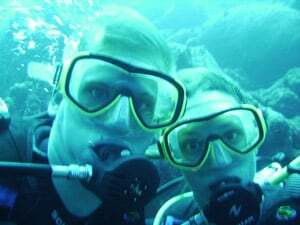 They are also PADI certified dive instructors, and Brenna and I were able to get Nitrox certified on the Deep Blue. I would heartily recommend diving the Galapagos Islands on board the Deep Blue to a honeymooning couple who are experienced divers and want to go on the dive trip of a lifetime. The quality and quantity of the sea life varies based on the time of year, so make sure to do your research before you book. I would recommend August, when Brenna and I went, because it is one of the best times to see whale sharks. I also recommend booking early so you can score the coveted double bed equipped stateroom. After a week underwater in the Galapagos, Brenna and I returned to mainland Ecuador. We landed in Guayaquil, Ecuador and rented a four-wheel drive and made for Banos, in the Andes Mountains. The first 2 hours of our drive was uneventful, the cityscape gave way to banana groves as we drove steadily uphill. Then, as dusk descended, the road became a pot-holed mess and we became grateful for the high ground clearance of our Hertz provided 4x4. After a long drive through the evening, we arrived at our destination, the Sangay Spa Hotel. The Sangay Spa is a quaint little mountain hotel based at the foot of a hundred foot waterfall, across the street from the hot springs that makes Banos famous. After a restful night sleep, Brenna and I spent the next day on a fourteen mile bike ride (mostly downhill!) to see the seven waterfalls that surround Banos and took a truck ride back to town. For an extra thrill we went bridge jumping over a mountain gorge. We also went canyoning, which is like kayaking down waterfalls without a kayak. We finished our time in Banos with a soothing soak in the volcanically-heated thermal baths that Banos is named for. Our time in the Andes was a wonderful treat and I wish we could have spent more time there. 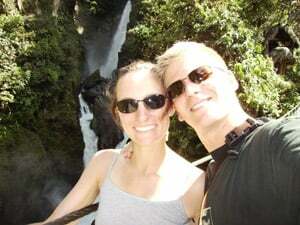 Including airfare (four flights within Ecuador), the price of our Ecuadorean honeymoon came to about $11,000. Traveler's Joy was a huge help in allowing us to pay for this fantastic dream honeymoon that we never could have afforded on our own. Brenna and I had been living together for several years before we got married, so when it came to registering, there wasn't much "stuff" that we needed. We really wanted to go on an amazing vacation and that's where Traveler's Joy came in. Most honeymoon websites have you choose from pre-planned, packaged trips, but Traveler's Joy allows you to completely customize your honeymoon to suit your individual tastes. With Traveler's Joy we were able to design our website based on our plans. We were able to break the trip up into easily affordable "units" that our guests were able to purchase for us through the Traveler's Joy website. For example, we registered for 14 different $100 "dives." Our guests were able to purchase the dives for us individually and Traveler's Joy forwarded us a check in the amount of our trip our guests had purchased for us which we were able to use to pay the Deep Blue's booking agency. Thank you Traveler's Joy for making this amazing trip attainable.